Jesus humbled himself to death, even death on a cross. 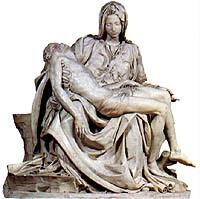 This is the famous marble sculpture by Michelangelo, 'The Pieta' (1498-99), 174 x 195 cm (5 3/4 x 6 ft), Basilica of St Peter, Vatican. I can't help but conclude that the Philippian church had a problem with unity -- and with the humility required to achieve that unity. If not, why would Paul spend a significant part of this short letter exhorting them about it? Paul pleads with the Philippian Christians to listen to what he has to say, to open their spiritual ears. Paul is saying, if Christ has benefited you in any way, I beg you to listen to me. Let's look at the benefits that Paul piles one on top of another in verses 1-2 as inducements to unity. "Encouragement" (NIV, NRSV) or "consolation" (KJV, Greek paraklēsis) here means "the act of emboldening another in belief or course of action" and "lifting of another's spirits." Paul is saying, if Christ has encouraged you by being united to him, listen! "United with Christ" (NIV) is the phrase en Christō that we see throughout Philippians and all of Paul's writings. (See the Introduction for a study of the phrase in Philippians.) Any internal unity the church is going to experience must be preceded by an individual unity with Christ by each of the members of the church. "Comfort" (NIV, KJV) or "consolation" (NRSV, Greek paramythion) means "pertaining to that which offers encouragement, especially as consolation, means of consolation, alleviation ... solace." Here Paul is particularly referring to the comfort derived from realizing that you are intensely loved by God. "Fellowship" (NIV, KJV) or "sharing" (NRSV) is the Greek word we've see a number of times in Philippians, the noun koinōnia, "sharing, partnership, fellowship." (See a more complete word study in the Introduction.) Paul is reminding them of their participation in the Holy Spirit as an inducement to listen. "Tenderness" (NIV), "compassion" (NRSV), "bowels" (KJV) is the Greek noun splanchnon, "of the seat of the emotions, heart ... the seat and source of love, sympathy, and mercy." (We also saw this word in 1:8). "Compassion" (NIV), "mercies" (KJV), "sympathy" (NRSV) is the Greek noun oiktirmos, "display of concern over another's misfortune, pity, mercy, compassion." Here, paired with splanchnon, the words together mean "tender compassion." Paul is pleading: If you have any tenderness in you, any compassion, then listen to me! If your blessings from being a Christian mean anything to you, Paul implores, listen to me: You must have the attitude of humility within you that Jesus Christ himself has. "Like-minded" uses the Greek verb phroneō, "to think," which occurs three times in our passage, twice in verse 2 and again in verse 5. "Like-minded" (NIV, KJV) or "of the same mind" (NRSV) translates a combination of two words autos, "same" and phroneō. Here the verb means "to have an opinion with regard to something, think, form or hold an opinion, judge." Later in this verse it is used with the numeral "one" (heis) and translated, "being one in ... purpose" (NIV), "of one mind" (KJV, NRSV)." Think the same, Paul commands us. Is he appealing to some kind of politically correct "group think"? I don't believe so. Paul recognizes and applauds differences in people (1 Corinthians 12). But he calls them to the same attitude of mind, the same humility, the same way of thinking about life and others, the same kind of selflessness. Think the same when it comes to selfless humility, he tells us. "Being one in spirit" (NIV), "being of one accord" (KJV), "being in full accord" (NRSV) translates the Greek noun sympsychos, literally, "united in spirit," "harmonious." This is a compound word from syn, "together, united with" and psychē, "soul." Put together, the compound word means, "harmonious in soul, souls that beat together, in tune with Christ and with each other." Paul has called them to unity with positive exhortations. Now he calls them by warning them against the negatives, the destroyers of unity. What are the false motives that can destroy unity? Selfishness and vanity. "Selfish ambition" (NIV, NRSV) and "strife" (KJV) we saw already. In explaining the false motives of his opponents in Rome (1:17), he has set them up to consider their motives within their own congregation. The Greek noun is eritheia, "selfishness, selfish ambition." The word is a rare one, found prior to New Testament times only in Aristotle as "a self-seeking pursuit of political office by unfair means." "Vain conceit" (NIV), "vain glory" (KJV), and "conceit" (NRSV) is the Greek noun kenodoxia, "a vain or exaggerated self-evaluation, vanity, conceit, excessive ambition." If you've been around the church very long you've seen these: Powerbrokers who keep a lock hold on the church because it is their way to retain power. And those who are puffed up in their opinion of themselves and their importance. These attitudes are death to unity within the church. Paul has considered the opposites. Now he expounds on the virtues of humility. In the Greek world of Paul's day, humility was looked down upon, considered a sign of weakness. But Christians know that it is their hallmark, the way of life of their Master. Far from being weak, humility takes the strength of the Holy Spirit since, it goes against our human nature. "Humility" (NIV, NRSV) and "lowliness of mind" (KJV) is the Greek noun tapeinophrosynē, "humility, modesty." This is not an emotionally-needy, false humility that fishes for compliments in order to feel good about oneself. Nor is it a Uriah Heep slimy humility that is all show in order to manipulate others. This is genuine humility that will actually "consider others better than yourselves." Wow! How do we do that with authenticity? Some resort to a negative humility of self-deprecation, inability to take a compliment. There is a sort of Christian piety that runs itself down obsessively. We see the mild form of this in Paul's statement: "Christ Jesus came into the world to save sinners; of whom I am chief" (1 Timothy 1:15). Paul realizes his unworthiness to be an apostle (1 Timothy 1:13; 1 Corinthians 5:19; Ephesians 3:8), but he isn't obsessed with it. That isn't the source of his humility. The famous hymn "Amazing Grace" begins "Amazing grace, how sweet the sound / that saved a wretch like me." But the focus of the song is not groveling, but amazement and wonderment in the grace of God that has always been with us and always will be. The focus is God. Real Christian humility isn't found in self-deprecation. "Look to" (NIV, NRSV) is the Greek verb skopeō, "pay careful attention to, look (out) for, notice." Paul isn't encouraging us to be busybodies, always prying into others' affairs (2 Thessalonians 3:11; 1 Timothy 5:13). But rather to care about others' needs over our own. Paul's example in this brief letter is his assistant Timothy: "I have no one else like him," writes Paul, "who takes a genuine interest in your welfare. For everyone looks out for his own interests, not those of Jesus Christ" (2:20-21). Q1. (2:1-4). To achieve unity in your congregation, why is humility necessary? Can you give an example of how lack of humility caused a division in your church? What are you doing to bring unity in your church? Now having talked about the importance of humility and defined it positively and negatively, Paul gives us the supreme example. "The evidence for this is found in the stately and solemn ring of the words and the way in which the sentences are constructed. The words are obviously carefully chosen, with the result that, when the verses are read aloud [in Greek], the stress falls in such a way as to give a rhythmical cadence to the lines.... We must also take into account the presence of extremely rare words." Christology, or the study of Christ, owes a great deal to these few verses, for the hymn focuses on Christ's relationship to God the Father -- his humiliation, his crucifixion, and his exaltation. These verses also provide important underpinnings to our understanding of the Trinity, especially as formulated in the Nicene Creed. Let me explain about the Nicene Creed so you'll know the importance of what you are seeing in 2:6-11. In the fourth century church there was a lot of disagreement about the nature of Christ's divinity. Alexander, Bishop of Alexandria understood Jesus and God the Father to be equal in their divinity, though separate persons. He believed that Jesus was always with God (John 1:1-2) and that there never was a time that Jesus did not exist. Arius, also of Alexandria, understood Jesus to be a lesser divinity. That there was a time when Jesus didn't exist. That Jesus was exalted to his high position because of his obedience to God in redeeming man. Present-day Jehovah's Witnesses hold some of the same positions as Arius, and in some ways Arian beliefs underlie LDS understandings of Christ as well. Back in the fourth century, bishops of the various cities began to take sides with a great deal of acrimony. In order to bring peace in his empire, Emperor Constantine (the first so-called "Christian" emperor) called for the Council of Nicea which took place at Nicea (present day Iznik in northern Turkey) in 325 AD. Here 250 to 300 bishops of the church gathered to better understand what the church believed about Christ's nature and what the Scriptures taught. Of course, there were politics and, unfortunately, lots of acrimony. Let's examine this Christian hymn found in 2:6-11 in some detail. The meaning of these verses has been vigorously debated by scholars, but I'll try to simplify the issues for you. Hang in here with me. The issues are a bit technical, but are vitally important to how we understand who Christ is! Paul begins by describing the state of the preexistent Christ. Paul shares with other New Testament writers the conviction that Christ existed from before time began (John 1:1-2; Colossians 1:17; Hebrews 7:3; 13:8; Revelation 22:13, cf. Proverbs 8:22-31). The Nicene Creed states it this way: "begotten of the Father before all worlds." "Nature" (NIV) or "form" (KJV, NRSV) in both verses 6 and 7 is the Greek noun morphē, "form, outward appearance, shape." In the Greek papyri, morphē refers to that "form which truly and fully expresses the being which underlies it." (Paul uses the same word morphē in verse 7, "taking the very nature of a servant.") Does this mean that the preexistent Christ only had the shape of God? Or that he was God? I believe that it is saying that he was God. Jesus was and is divine -- pure and simple. begotten, not made, being of one substance (homoousios) with the Father." In other words, to put it rather crudely, Jesus is made of the very same divine "stuff" that the Father is made of. "Equality" (Greek isos) means "pertaining to being equivalent in number, size, quality; equal." But did the preexistent Christ have this equality with God? It all hinges on the meaning of a very rare Greek word, used only here in the New Testament, the Greek noun harpagmos. It is translated variously: "Something to be grasped" (NIV, RSV), "something to be exploited" (NRSV), and "robbery" (KJV). The basic meaning, "a violent seizure of property, robbery," can move to, "something to which one can claim or assert title by gripping or grasping, something claimed." Whatever, the exact meaning of harpagmos, it seems clear that the preexistent Christ already possessed equality with God, and determined not to clutch at it or cling to it, but rather to obey his Father and humble himself. Q2. (2:6) In your own words, what does it mean that Christ didn't cling to his equality with God? How specifically does this passage teach that Jesus is divine? The hymn has discussed Christ's preexistent state. Now it turns to his human state. The meaning of the Greek words themselves are clear enough. "Made himself nothing" (NIV), "made himself of no reputation" (KJV), and "emptied himself" (NRSV) is the Greek verb kenaō, literally, "to make empty, to empty," and figuratively or metaphorically, "to make of no effect." Used with the emphatic "himself" makes it clear that this was a voluntary action by the preexistent Christ. We may see echoes here from the Suffering Servant passage in Isaiah 53:12 where, "he poured out himself to death." But just what did this kenosis ("emptying") entail? The Danker says that kenaō is used of "divestiture of position or prestige." When used in Philippians of Christ, "he emptied himself, divested himself of his prestige or privileges." "He took on the form (morphē) of a slave," an expression of servility. This is in contrast to expression of divinity in the preexistent Christ, "although he was in the form (morphē) of God." The hymn says he was "made in human likeness." "Likeness" is the Greek noun homoiōma, "state of being similar in appearance, image, form," used thus both here and in Romans 8:3. Danker comments, "In the light of what Paul says about Jesus in general it is probable that he uses our word to bring out both that Jesus in his earthly career was similar to sinful humans and yet not totally like them." The Greek noun schēma means "the generally recognized state or form in which something appears, outward appearance, form, shape of a person." Was Jesus really human or just pretending to be? A second century Christian heresy, Docetism, held a Hellenistic dualistic view that spirit is good and flesh is evil, thus Jesus could not have become flesh and thus partaken in human evil. Ergo, Jesus must have been merely pretending to be human. "This is how you can recognize the Spirit of God: Every spirit that acknowledges that Jesus Christ has come in the flesh is from God, but every spirit that does not acknowledge Jesus is not from God" (1 John 4:2-3a). whose kingdom shall have no end." Q3. (2:7-8) Was Jesus really a human being or only pretending to be one? What do these verses teach? What difference does it really make whether or not Jesus was human? Jesus' death on the cross is comparable to being executed as a criminal by the electric chair or a slow public death by hanging -- a shameful and tortured death, nothing as painless or private as lethal injection. Paul's point all along is that Jesus set the ultimate example of humbling oneself rather than insisting on one's own way with selfish ambition and vain glory. Jesus did this twice over -- first in his humbling by becoming a human being and whatever loss of divine power and prestige that required. Then again by voluntarily assenting to the most shameful and painful death imaginable in his day. Jesus humbled himself, Paul insists, and we must, too. Why does this stanza of the hymn begin with "therefore"? Is it a reward for Christ's obedient humiliation or an assertion of his victory over the principalities and powers? Neither. It is best understood as God's vindication of Christ's humiliation unto a shameful death. It is God's "yes" to Christ's equality with God. It is no accident that genuine, self-imposed humility is the only way that love and unity can flourish in the Church, the Body of Christ. And Jesus himself leads the way. Q4. (2:9-11) We know we're supposed to humble ourselves like Jesus did. But how can we know whether or not God will exalt us? Why do we get impatient with this? What does our impatience sometimes lead to? Part of Christ's exaltation is God giving to him "the name that is above every name." What is this name? There are two possibilities. Jesus. Certainly the name of Jesus is an exalted one. It means "Yahweh saves" (cf. Matthew 1:21) and was similar to the name of Moses' successor Joshua. "In the name of Jesus Christ..." is used with power and for baptism by the early disciples (Acts 2:38; 3:6; 16; 4:10, 18; 5:40; 8:12; 9:27; 10:48; 16:18; 26:9). Lord. What it means when every tongue confesses "that Jesus Christ is Lord" is "that Jesus the Messiah is Yahweh -- God himself." The Hebrew word Adonai, "lord" was used in the Jewish reading of the Hebrew Scriptures to substitute for the Divine name, Yahweh. Thus "Lord" became equivalent to God himself. To call Jesus "Lord" is to declare him divine and due the same level of worship as God the Father. "All authority in heaven and on earth has been given to me" (Matthew 28:18). O'Brien notes, "In his exalted state, Jesus has a new rank involving the exercise of universal lordship. This gain was in official, not essential, glory since Jesus did not become divine through exaltation." "whom the Lord Jesus will overthrow with the breath of his mouth and destroy by the splendor of his coming" (2 Thessalonians 2:8). In Romans 14:10-11, Paul identifies this time of kneeling and confessing with "God's judgment seat" or "the judgment seat of Christ" (2 Corinthians 5:10). Judgment will take place "in the presence of God and of Christ Jesus, who will judge the living and the dead" (2 Timothy 4:1). In Revelation 20:11-15 we see this awesome courtroom with the great white throne of judgment where all are called to judgment and no longer show any rebellion in the face of his holy righteousness. Lord, so often I see in myself a desire to be appreciated by others, to be recognized, to be somebody, to push myself forward. Then I see Jesus who humbled himself to the lowest place -- for me. Give me enough faith that you will exalt the humble so I will stop attempting to do it for you. Forgive me. In Jesus' name, I pray. Amen. Paraklēsis, can carry the meanings "encouragement," "strong appeal," or "comfort" (BDAG 766). Paramythion, BDAG 769. While this can have a similar meaning to paraklēsis, in this verse paraklēsis carries the idea of encouragement while paramythion carries the idea of comfort or solace in struggle. The pairing of these words is a hendiadys, "the expression of an idea by the use of usually two independent words connected by 'and' instead of the usual combination of independent word and its modifier" (Merriam Webster's Collegiate Dictionary (Eleventh Edition; Merriam-Webster, 2004), p. 581). Robertson, Word Pictures in the New Testament. Tapeinophrosynē, BDAG 989. Elsewhere in the Greek language you can find the verb used in a pejorative sense, but in the New Testament it is used only in a favorable sense. "Consider" (NIV), "esteem" (KJV), and "regard" (NRSV) is the Greek verb hēgeomai, "to engage in an intellectual process, think, consider, regard." With the double accusative, as in 2:3a, it means "look upon, consider someone or something (as) someone or something" (BDAG 434). "Attitude" (NIV) or "let this mind be in you" (KJV, cf. NRSV) is the Greek verb phroneō, which we saw twice in 2:2. Here it means "to develop an attitude based on careful thought, be minded, be disposed" (BDAG 1065-1066). Martin, Philippians, pp. 110-111. He has also developed this in his monograph, An Early Christian Confession. Philippians 2:5-11 in Recent Interpretation (London, 1960). The history and issues behind the Nicene Creed are well laid out in "Debating Jesus' Divinity: The; Council of Nicaea and Its Bitter Aftermath," Christian History and Biography, Issue 85, Winter 2005. "Being" (NIV, KJV) or "though he was" (NRSV) is the Greek present active participle of hyparchō, "to be," a widely used substitute in Hellenic Greek for einai. J.H. Moulton and G. Milligan, The Vocabulary of the Greek Testament, 417, cited by G.F. Hawthorne, Philippians (Word Biblical Commentary; Waco, 1983), p. 83. O'Brien, Philippians 207-211, details five different understandings of morphē in this verse. From a study of the grammar of verse 6 he concludes, "This then, is what it means for Christ to be 'in the form of God;' it means 'to be equal with God,' not in the sense that the two phrases are identical, but that both point to the same reality" (p. 207). "Humbled" is the Greek verb tapeinoō, "to cause someone to lose prestige or status, humble, humiliate, abase" (BDAG 990). A related word occurs in the Greek Septuagint translation of Isaiah 53:8, "in his humiliation...."
 "Obedient" is the Greek adjective hypēkoos, "obedient" (BDAG 1035) from the verb hypakouō, "to follow instructions, obey, follow, be subject to" (BDAG 1028-1029). "Confess" is the Greek verb exomologeō, here means, "to declare openly in acknowledgement, profess, acknowledge" (BDAG 351).